Ace of hearts is no longer just part of a dead man's hand, now it is the youngest local rock band! Chloe, Chris, Kevin, and Helen performed their first show last night at Mountain State Brew Pub and the stage will never be the same. If you attended, you can brag you saw them when... A huge, huge thank you to our community for the large turn out! Our children may not fully realize how special a place in which they live, but the amazing support you showed the band last night illustrated it well. Moving here was the best decision we may have ever made, thanks again to everyone!! 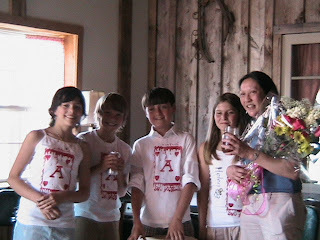 The songs performed by Ace of Hearts can be found on You Tube, just type in Ace of Hearts, or for a more direct route type in 4359560w (that's my account name, using 4359560w should save you from pages and pages containing the words Ace of Hearts, including another kid band!). The first song from the first set is here, click it and enjoy! Abus is in making Lemon and Lime Bars, and Gary is whipping up another Cheesecake and Blueberry Muffins. With friends like these I need a personal trainer and a cardiologist. The counter is again looking dangerous! There is a tornado watch for us today so join us for the tornado party. We are experienced in hurricane parties and are probably the only business on the mountain top that has that bragging right! Remember, we are professionals!